You love your car and love it passionately! Isn't it so? And, you wish that your car looks at its best all the time. But, this is also true that you can't take your car everyday to service center. Aromatree offers affordable, highly effective and most importantly 'do it yourself' products for beauty treatment of your car! The combination of Dash Board Shiner Cream, Car Polish and Tire Dressing Cream provides a powerful and very convenient tool to instantly give 'makeup' to your car to look its best. Instantly shines dash boards & vinyl surfaces. Extremely low dust attraction. Does not cause excess glare. Acts as a release agent for dust, dirt and food spills. Prevents scratches and aging of surfaces. Refreshing fragrance. Quick and easy to use. Cleans, Shines & Protects. Free from abrasives. For interior & exterior use. Non-oily, non-greasy finish. Smudge & streak resistant finish. No increased Dust attraction. Improves life of paint. Cleans, Shines & Protects. 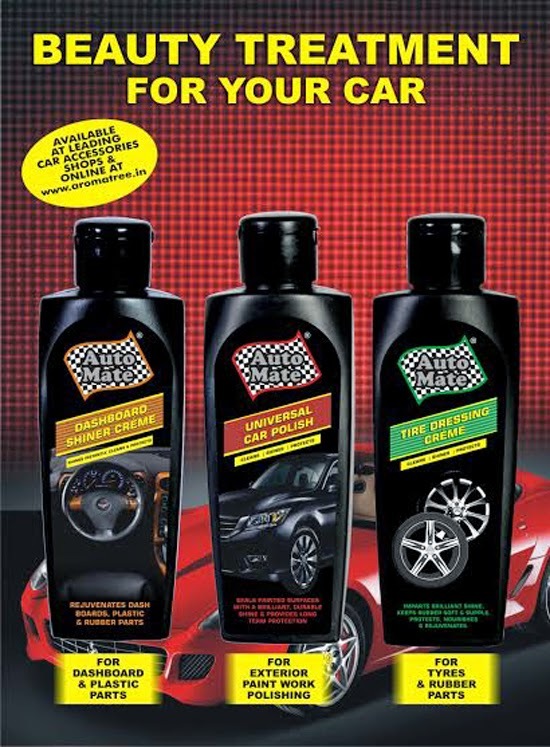 Keeps tires and rubber parts soft and supple. Protects rubber from drying due to environmental attack Prevents abrasive wear of side walls. Prevents hard adhesion of dirt. Minimal dust attraction.